Another week, another achievement. This one for clearing Rise of the Zilart. Ninja, Samurai, and Monk are now 52 and the San d’Orian story is complete. I also made it past the midpoint of Chains of Promethia. Progress, but not enough. Zilart went pretty smoothly. I’m a little disappointed I let the Elvaan Ark Angel kill me, but he kept shield bash stunning me, I never really got my buffs set and took an 1100 damage weapon skill. I only have 1500 HP. 2nd attempt went much smoother. I picked up Chains of Promathia in Chapter 3 and immediately hit slow down. A ton of running around viewing cutscenes and a trip to Attowha Chasm. What a maze that zone is. Finding the ??? wasn’t that bad, but climbing to the top of the nearby mountain was ridiculous. I should have been leveling since there is no guarantee that the XP chain bonus will continue into the next week of the Vana’diel Rainbow Campaign. However, I noticed Bastok was leading and decided to go through the story missions and grab the Republic Aketon in case Bastok drops to last for awhile. Unfortunately, I couldn’t quite get in done in one evening and it didn’t matter because unlike when I turned to San d’Oria, I did not keep my conquest points. It’s going to take a lot of leveling to get back to 56k. I don’t even have enough points to recharge my Empress Band. I have 4 missions left, so I might as well finish those, then I’m going to hit some melee classes. Thief is currently 25 and Warrior is 20. Everything else is at 10. The plan is to get everyone to 50, get rid of unnecessary <50 gear to clear some room for >50 spark gear. I finally made some progress in The Witness and cleared the Monastery. The final puzzle there, the one I was stuck on, reminded me that the solution is not always right in front of you. Still struggling with the final lock on the end game, but I did make start working on the forest area next to the Quarry. I could have sworn the last time I was here the panel was still dark, so I must have triggered something somewhere. Not difficult so far, it’s just based on silhouettes, but obstructions are quickly complicating things. I had two reasons for returning to Final Fantasy XI. One was to play through the story missions and “beat” the game. The second pertains to Square Enix closing the Xbox 360 servers at the end of March and making the achievements impossible to obtain. When I started back in early January, all but two seemed possible. As the cutoff approaches I realize I probably needed to dedicate almost all of my free time to make it happen. In two months I have popped 8 achievements. It took way too long to get my level 50 Red Mage to 99. Now at max level with Item Level 117 equipment, things are starting to fall into the place, but most of the achievements are for reaching 75 with each class. With a XP ring and all the +30% boosts from Rhapsodies of Vana’diel, I took my Rune Fencer from 1 to 43 in just a few hours. I probably wasted more time swapping equipment than I did leveling. I can easily get one more +30% boost and each run should get easier, but with three weeks and 18 classes to level… And after consulting the list, Rune Fencer was added to the game too late to have an achievement tied to it, so yet another afternoon that accomplished nothing. On the other hand, as someone who has always sucked at PVP, I closed with a 1.15 K/D ratio and 33 wins out of those 65 games. As a solo player, I did get dropped into quite a few lost cause games with no chance of a win. Most games I hovered around 1.0 K/D, but I had far more good games than really bad ones. Best game was a 25 Kills, 8 Deaths worth 2910 points. Plenty of 5 kill streaks, but I never managed to hit 10. PVE is still my focus in this game, but I can see myself jumping into more Crucible matches. A long time ago, I was a pretty avid Final Fantasy XI player. I was nearing endgame in late ’04 when my interest in the game waned. I came back briefly for Treasures of Aht Urghan, but ended up staying only long enough to unlock the new jobs. Back then if you wanted to get anything done late game you needed at least a full party of six, if not an alliance of 18. Coming back to it 9 years later, it’s shocking how much has changed. There is still endgame content that requires a party or alliance, but the vast majority of the game can now be done solo or with a party of trusts you can summon. Their AI isn’t the best, but they can get the job done. After a few calls to Square, I was finally able to log in as Zaisha, a level 50 Mithran Red Mage. Six weeks and nine limit breaks later, I’m finally level 99. I’ve dabbled in some of the missions, but with the crazy stat boosts on the lv99 gear, I can cruise through the rest of the mission content. I’m not sure how far I can into the Rhapsodies of Vana’diel content before actually need other people, but I’ve got a pretty active linkshell I can fall back on. Plans for the next week are to finish the Windurst storyline and do Wings of the Goddess missions until I can resume Rhapsodies of Vana’diel. I’d also like to start leveling a melee class. I’ve taken White and Black Mage to 50, but most of my other jobs are somewhere between 1 and 10. I’ve never been a fan of competitive multiplayer games. I have fond memories of dorm room Goldeneye, and dabbled a bit in Halo ODST/Reach’s. Mostly just fumbled my way through unfamiliar maps while getting killed. Fast-forward to Destiny. Even as Taken King grabbed me and I made friends that have kept me playing, I avoided the competitive Crucible mode. That is until the last few weeks. Something happened during the Valentine’s Day themed 2vs2 Crimson Doubles. I didn’t hate it. In fact… I kind of enjoyed it. Enough that I decided that I was going to hit Rank 5 in this week’s Iron Banner. I’m winning about half my games (or at least my team is) and I have a respectable 1.07 KD ratio. I still have some really terrible matches, but I’m having far more good to average ones. Once I turn in today’s bounties and the final weekly one, I should hit Rank 5. I can spend the remainder of Iron Banner hoping for (but not getting) some decent loot. The final game I’ve been working on is Fire Emblem Fates: Birthright. I managed to get the Special Edition, so I have a ton of content to play through. Currently in Chapter 9, I’ve been doing some of the DLC and side content. In many ways this game is just more Fire Emblem, but I have no issues with that. The base game is fun enough, that it doesn’t need much to remain fun. Weapons no longer degrade, which is perfectly alright. I was never a fan of keeping a huge stock of weak weapons, so I could save my good weapons for tougher enemies. Still playing with permadeath on, though I’ve decided to not reset the game on a character’s death. A rule I already broke two turns after the decision. Poor Hana took a 30% counterattack and did not survive the following enemies turn. I noticed a chest back at the beginning that I was never going to have enough time to get, so I reset. In hindsight, much like permadeath, that is something I should have forced myself to live with. I’d like to make to about Chapter 15 over the next week. Dark Cloud 2 – I made it a few chapters in back in the PS2 days and it still holds up well today. Halfway through the first dungeon. Captain Toad’s Treasure Tracker – Nearing the end and I’d love to beat it. Once I get past this tower of Boos. I’m disappointed with myself for skipping so many days so soon. 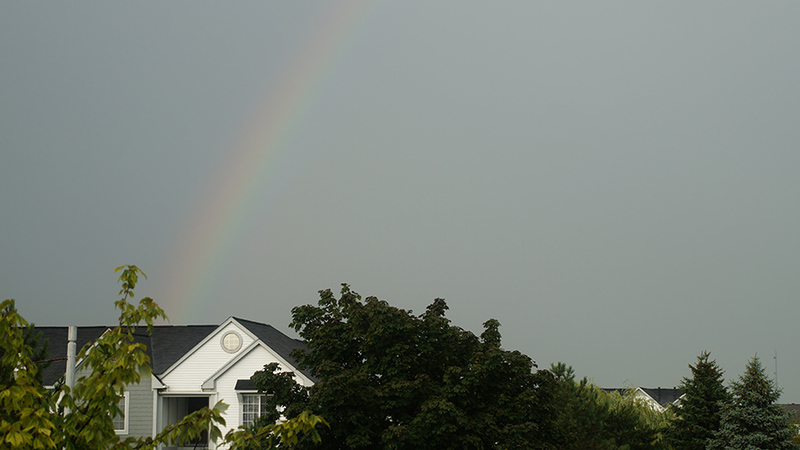 But it’s time to get back into it with this rainbow right outside my front door. I could see the sun shining brightly and plenty of rain striking the pond out back, so I knew one had to be lurking around somewhere. Something I’m going to have to look into is the fact that my camera won’t take a picture if it doesn’t have a focus on anything. That’s great when I’m trying to find the minimum focus distance on a close-up, but not so great when I’m trying to photograph light. 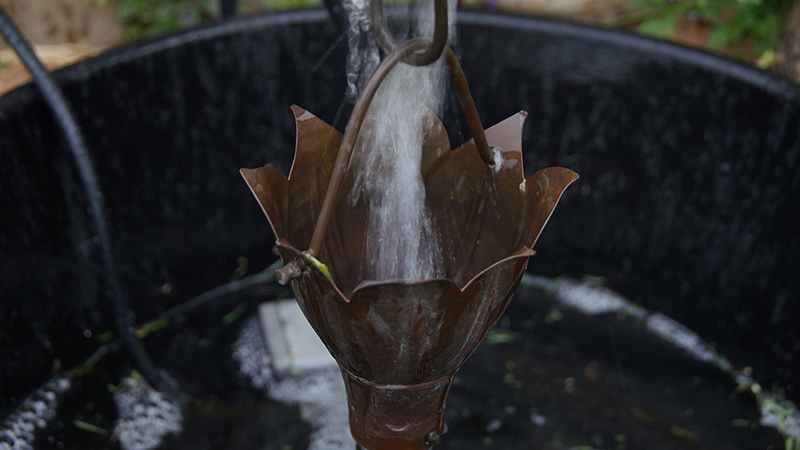 Water flowing through a fountain. Tried a variety of shots at various shutter speeds, but I like the blurring on this one. 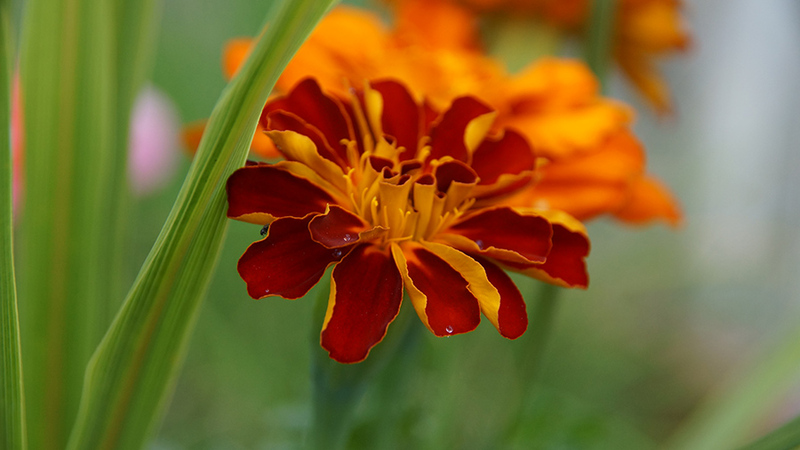 I would have preferred the tip of the flower to have remained in focus as well. Those little flying critters just don’t give you a whole lot of time to work with. 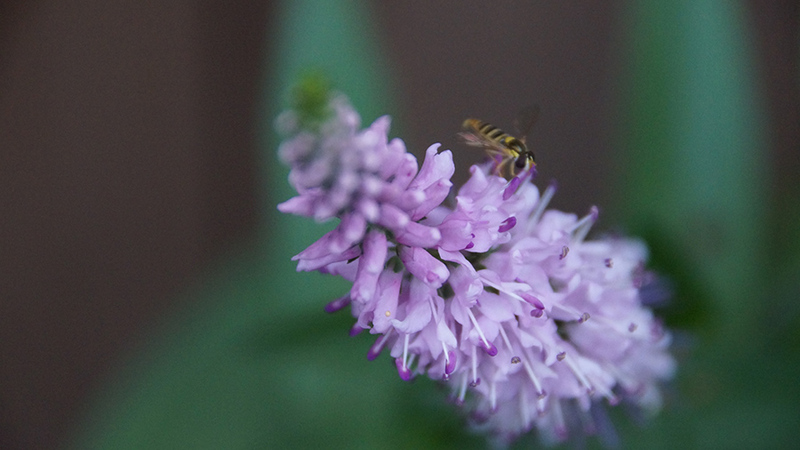 The next batch of pictures will be coming from my friend’s garden. We spent about a half an hour out there, photographing, until the threat of rain and the sting of mosquitoes drove us indoors for the remainder of the evening. 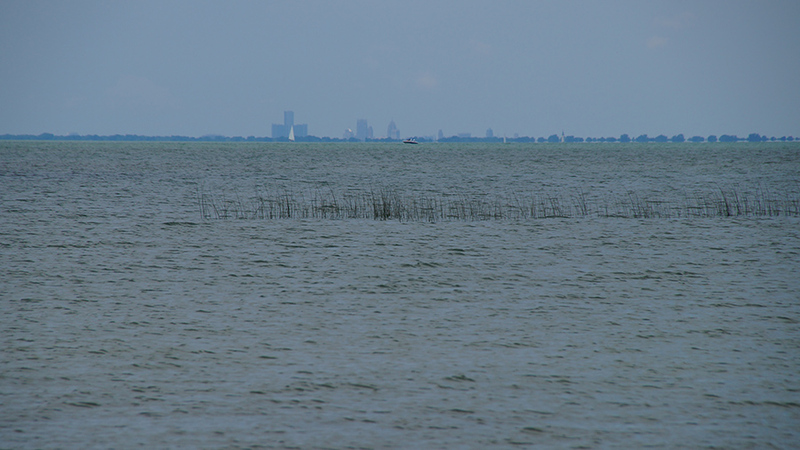 Detroit seems so far away, yet from the southern edge of Harsen’s Island, it doesn’t seem that far away at all. A trend for me this year seems to be managing to capture images of birds in flight and still have the picture turn out pretty decent as well. I’ll admit most have been accidental, but I’ll take what I can get. 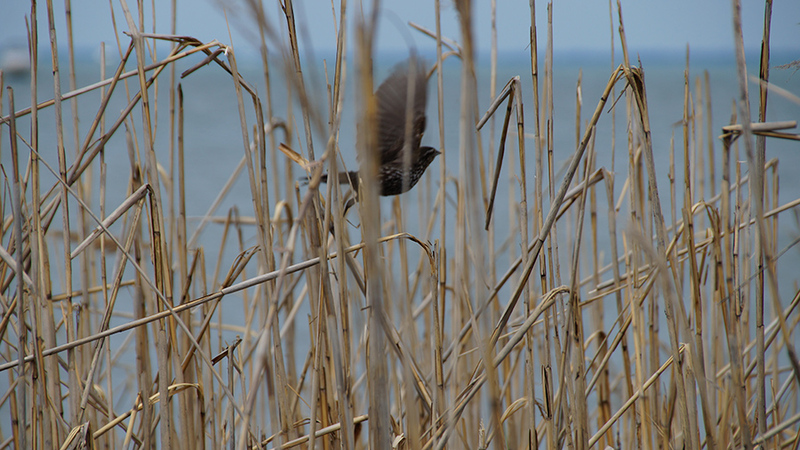 This particular bird was hopping around the brush on Harsen’s Island. At some point I may have to put together a little gallery on my main site to highlight these.